Battery life on LG should be better – and every single review shows that indeed, it is. 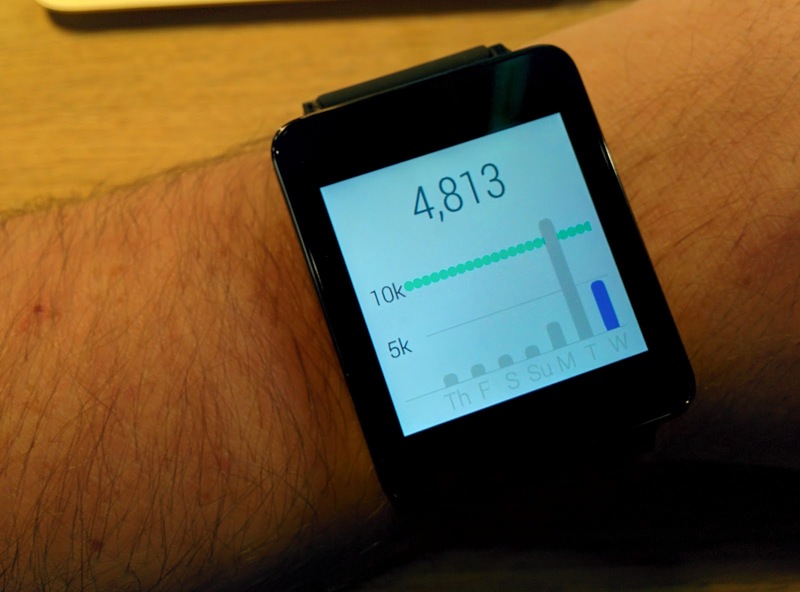 Overall looks – I kind of like rectangular unobtrusive look of the G Watch. It should be an accessory, not a Christmas tree light! So far, I am not at all disappointed (*) – watch performs formidably, doing everything it should and more. 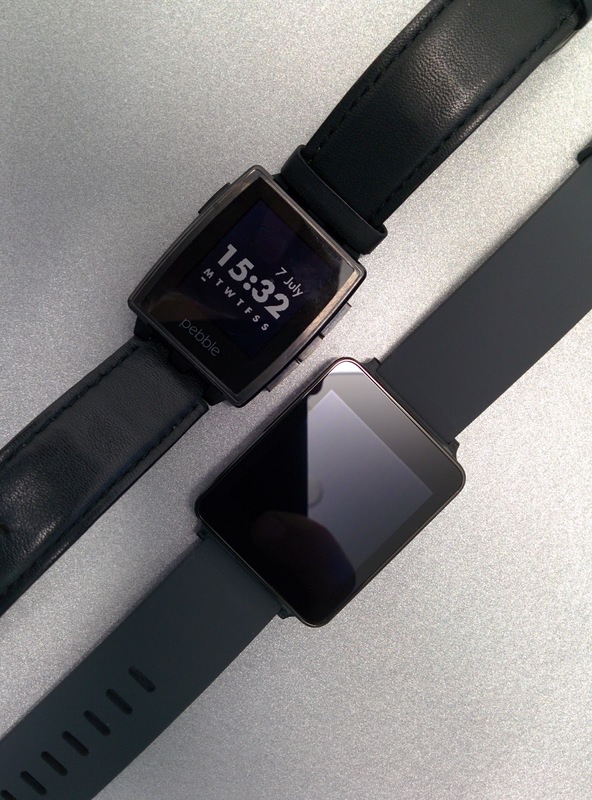 Since I used original Pebble and Pebble Steel before G Watch, it had a lot to live up to, so I tried to compare it side by side with the only smartwatch platform I know. Please note, that I will only use my own impressions and will not even recourse to data sheets to compare these two. Looks – as always, everyone's a critic and everyone's got their own preference. I like the way Steel looks, but big "Pebble" word kind of stands out and attracts attention. To me G Watch is a winner: it's black, it has no visible elements, it shows time. Weight – without checking the datasheets, roughly the same. Maybe G Watch is a bit lighter, but either way, their weight is largely unnoticeable to me. So let's go on ... what now? Screen. It's kind of hard to compare side-by-side an LCD with e-ink screen, but for what it's worth, they both have their own ups and downs for me. e-Ink is very visible in the sunlight, LCD can do colours. Very obviously and perhaps not unexpectedly, e-Ink delivers substantially better battery life time. And since we mentioned it, let's talk about the battery. 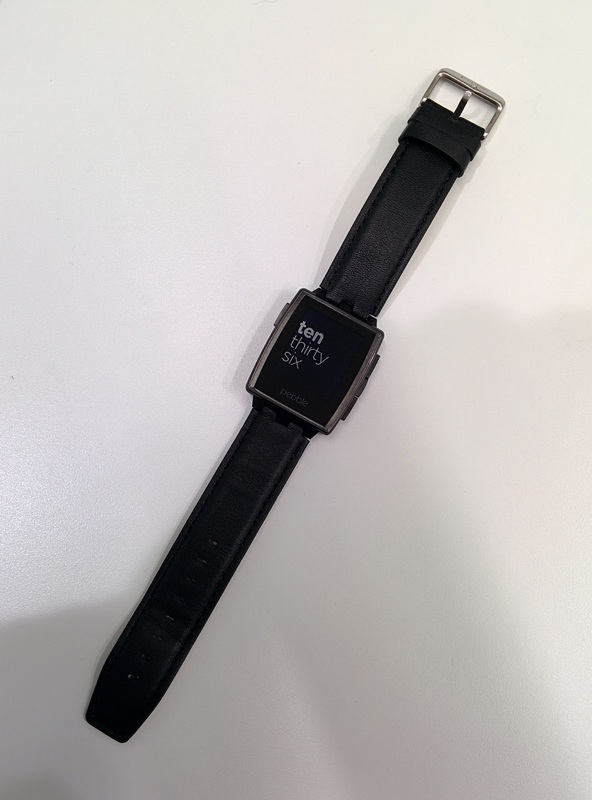 With Pebble and Pebble Steel I was easily getting 5 days of watch battery life on a single charge. With G-Watch [after a day of mildly intensive use] I'm roughly at 35-40% at 9pm. G Watch is a looser? Well, not exactly. No one expects LCD to perform as good as e-Ink; with that in mind, you get head and shoulders more functionality on G Watch. 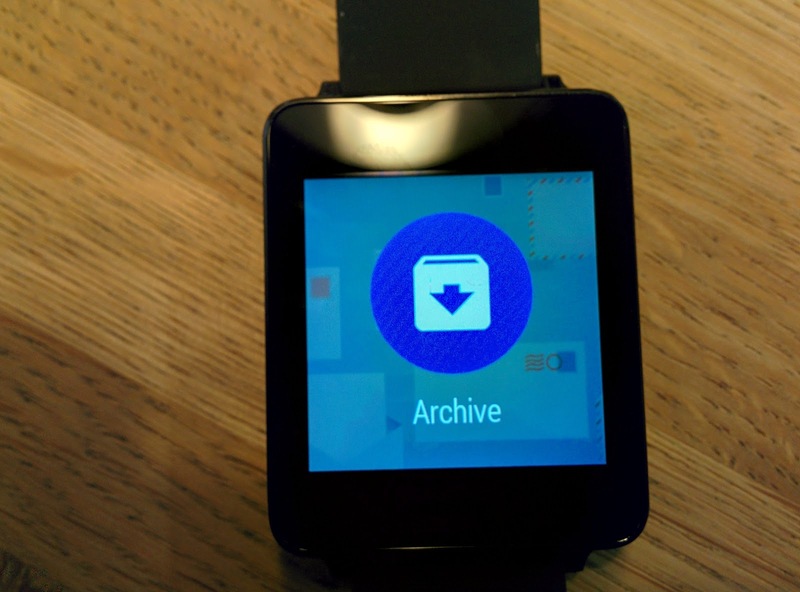 Functionality-wise, G Watch, being connected to an Android smartphone, rocks it like a hurricane. 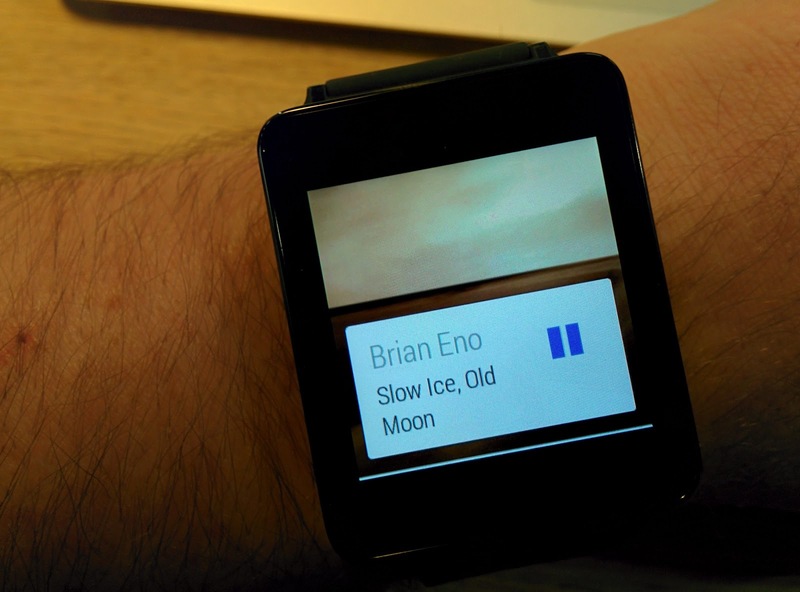 Since Google decided that supporting legacy mobile operating systems is not important (and I can hardly blame them), they were able to achieve an extremely high level of integration between the watch and the phone. To me, a killer feature is ability to quickly skim through emails on my watch without even pulling my phone out of the pocket. Some of you might know, that I receive a lot of emails . I am spending very significant chunk of my life just reading them on the phone and clicking "Archive" button if I don't feel like this emails needs my attention anymore. Surprise - with G Watch I can do this without pulling my phone at all! Swipe right, click "Archive" and get on with your life. Overall, the whole process – from the watch buzzing on my wrist to the point when I'm done with the email, it takes me about 5-10 seconds. Using phone, this will take at least three times as long. Imagine doing it 100 times a day! Another feature which I love a lot is a step counter. I used to wear Fitbit for quite some time and in fact, teased few of my friends to use it. Well, guess what - my right wrist is now empty again. 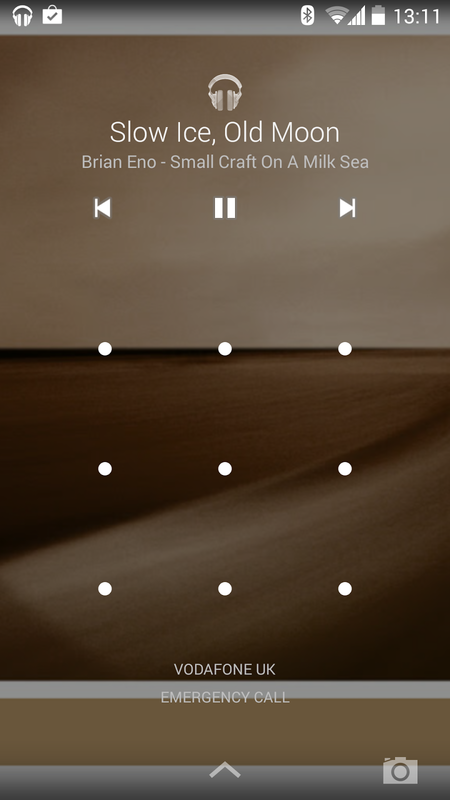 Controlling my music player is hardly something new - we had it on Pebble, we have it here. 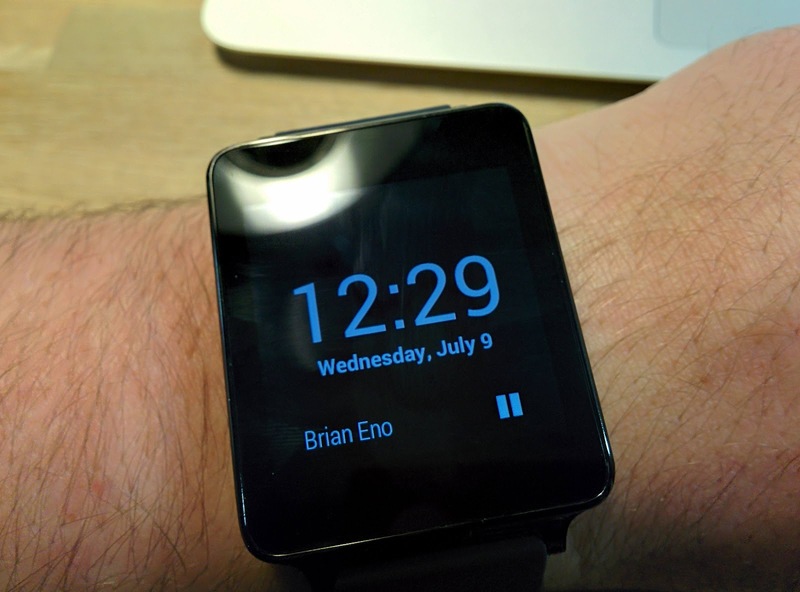 However, showing album art on your watch is a nice touch – hardly achievable on e-Ink screen. Overall, I am quite happy with my purchase and will continue using and exploring it. 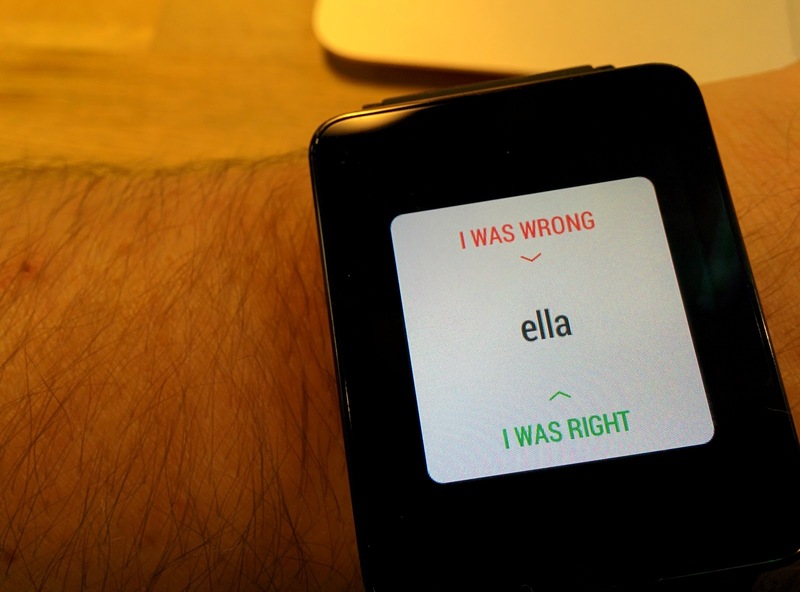 In due course, lots of apps supporting it will appear – right now I'm happily using Duo-Lingo quiz mode which is a quick and fun way of recalling everything you've learned.